The first smiling face you are likely to see upon entering Chiropractic Solutions is our office manager Marty Linz. She is the person to speak to for all scheduling matters and she will be the one who assures that we are in financial agreement by the time you leave. 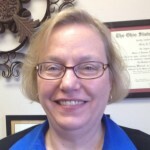 Marty is our Business Manager, and co-owner of the practice with Dr. Ralph. Here is her introduction! “I am originally from Cincinnati, have a Bachelors of Civil Engineering from Georgia Tech and an MBA from Ohio State University. I’ve lived in 11 other states and 19 other cities before coming to Huntsville! Through all of those moves, I remained friends with April (Hall) Ralph, my last roommate at Georgia Tech, despite the fact that we often lived hundreds of miles apart. When she was considering the purchase of this practice, she asked me if I would move to Huntsville and act as the business manager so that she could focus on patient care. So, I’ve taken leave of the high stress world of industrial construction where I most recently was a senior contract administrator on construction of a multi-billion dollar chemical plant in Clarksvillle, TN. Being here is a HUGE change of pace for me and I’m enjoying the opportunity to be a part of this vibrant practice. I’m also appreciating the opportunity to get weekly chiropractic care even though I luckily have no serious spinal issues to be addressed. If only someone had referred me to a chiropractor in the ’90s when I spent months dealing with extreme lower back pain!